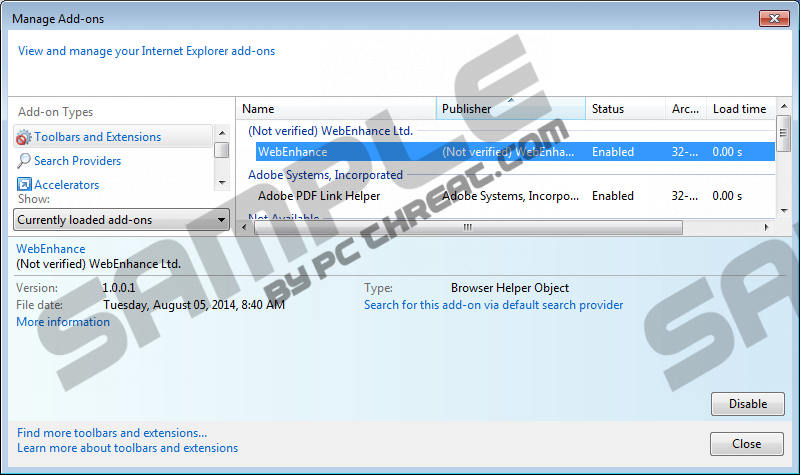 WebEnhance is a browser add-on that is aimed at enhancing your online experience. The program is designed to secure your browser, i.e. to prevent you from accessing phishing websites. WebEnhance is compatible with Internet Explorer, Google Chrome, and Mozilla Firefox and is available for downloading at web1enhance.net. Despite the fact that WebEnhance offers you a chance to start browsing the Internet safely, we recommend that you ignore WebEnhance because this program is an advertising-supported browser add-on. It means that it delivers third-party advertisements to your browsers, and these advertisements include coupons, web banners, and other forms of online commercial offers, and we recommend that you remove WebEnhance from your browsers. The browser add-on has been found to be distributed alongside other adware programs, including adware programs such as Lolipop, FlowSurf, and Cyclon Gems. Moreover, WebEnhance is bundled with MyPCBackUp and some other system optimization programs. If you want to prevent additional programs, always pay close attention to every installation process. WebEnhance is not liable for the content of the advertisements delivered to you because the sponsors of the program are not monitored or endorsed by the developers of the program. As a result, by installing WebEnhance, you accept responsibility for your online actions, which is why it is advisable to remove WebEnhance. WebEnhance advertisements have been found to be aimed at German computer users because all those pop-up windows are displayed on German shopping websites, including ebay.de, amazon.de, and other popular websites. It has also been observed that WebEnhance displays advertisements 12 hours after installation. Due to the fact that WebEnhance does not approve the sponsors, you should bear in mind that some of the advertisements may direct you to unknown websites, which is why you should be very careful when dealing with WebEnhance pop-ups, coupons, and other advertisements. Like other advertising-supported browser add-ons, WebEnhance collects certain non-personally identifiable information. The program records the addresses of the websites you visit, your operating system, browser type, browser settings, browser language, IP address, and some other details. The browser add-on collects information about you for statistical purposes which are supposed to enable the developers of the program to enhance the quality of the service and provide you with better offers. If you are determined to remove WebEnhance manually, use our below-given removal guide. But we recommend that you use a reputable security program because your operating system needs protection against malware and spyware threats, and this objective can be easily fulfilled by our recommended security program SpyHunter. This real-time security program can eliminate the unwanted infection and fight off numerous threats, so take action right now to get rid of WebEnhance. If you want to be sure that you are secure on the Internet, you should install a powerful scanner that is capable of identifying WebEnhance and many other insecure files. Click the button below to download our recommended security program and invest in the program if any malicious files have to be removed. Quick & tested solution for WebEnhance removal.